Filed to: will the real andrew wheeler please stand up?Filed to: will the real andrew wheeler please stand up? will the real andrew wheeler please stand up? Andrew Wheeler testifying before the Senate Environment and Public Works Committee in August 2018. The Trump administration is renowned for its inability to come up with a coherent narrative on basically anything from the government shutdown to wildfires. Which makes former coal lobbyist Andrew Wheeler uniquely qualified to be its Environmental Protection Administration (EPA) administrator. 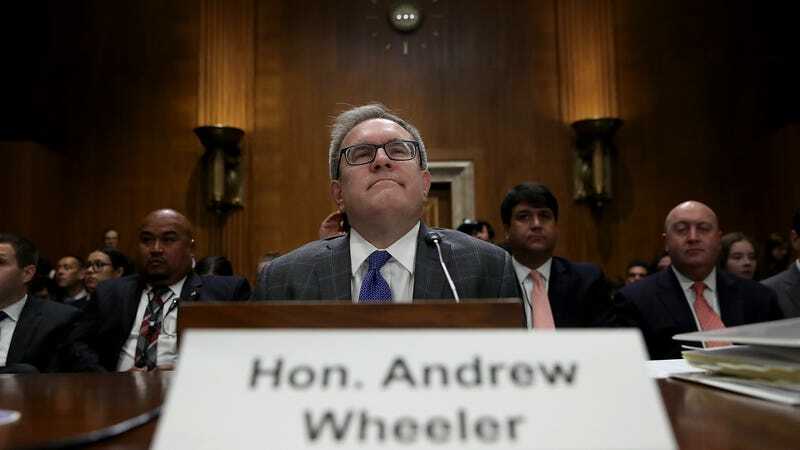 During his confirmation hearing on Wednesday, Democrats pushed Wheeler—who has been Acting Administrator since Scott Pruitt resigned in July—on his climate beliefs. They were, to put it mildly, a mess ranging from all-out worry to “eh, someone should probably do something about it.” Wheeler may not be, in the words of Delaware Senator Tom Carper, the “ethically bereft embarrassment Scott Pruitt proved to be,” but he still showed his predecessor’s ability to be slippery, especially when it comes to climate change. Which, damn. Maybe he just read the new World Economic Forum report showing climate change and extreme weather are the biggest threats to global stability over the next decade? But before you dap Wheeler with the secret resistance handshake, it may be worth reviewing his testimony from earlier in the hearing when Senator Bernie Sanders asked him on his climate beliefs. “Do you agree that climate change is a global crisis that must be addressed in an aggressive way?” Sanders asked after describing findings in last year’s landmark Intergovernmental Panel on Climate Change report. After trying to obfuscate, Sanders pressed Wheeler to answer the question directly. Not the greatest crisis doesn’t sound like a 9 type of guy, but “huge issue” is still pretty bad so I guess more like 6? Ah, but then there’s the policy. Wheeler talked up the EPA’s plans to rollback regulations on vehicle and power plant emissions, policies the EPA itself has warned will contribute to the huge issue of climate change. The rollbacks started under Pruitt and Wheeler wants to see them to fruition. He pointedly noted in his hearing he wants a full “50 state deal” on car emissions, which would mean revoking a waiver California has for more stringent emissions standards or requiring the state to scrap its plans, something that seems exceedingly unlikely. His call for global solutions to climate change is also a red herring. The U.S. is the largest historic greenhouse gas emitter and currently the world’s number two behind China. Its emissions—along with the world’s—rose last year. With Trump announcing his intent to pull out of the Paris Agreement, the main way for the world to tackle climate change right now, the administration Wheeler is a part of has no intent of addressing the issue globally. So I guess we’re back to square one for Wheeler. Despite the backasswards approach to climate change, Wheeler is likely to be confirmed in the Republican-controlled Senate.